Today, the world is trying to create and educate data scientists because of the phenomenon of Big Data. And everyone is looking deeply into this technology. But no one is looking at the larger architectural picture of how Big Data needs to fit within the existing systems (data warehousing systems). Taking a look at the larger picture into which Big Data fits gives the data scientist the necessary context for how pieces of the puzzle should fit together. Most references on Big Data look at only one tiny part of a much larger whole. Until data gathered can be put into an existing framework or architecture it can’t be used to its full potential. 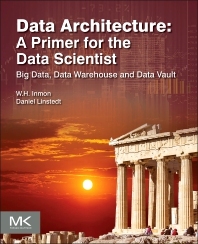 Data Architecture a Primer for the Data Scientist addresses the larger architectural picture of how Big Data fits with the existing information infrastructure, an essential topic for the data scientist. Turn textual information into a form that can be analyzed by standard tools. Shows how to turn textual information into a form that can be analyzed by standard tools. 2.2: What is Big Data? Best known as the “Father of Data Warehousing,” Bill Inmon has become the most prolific and well-known author worldwide in the big data analysis, data warehousing and business intelligence arena. In addition to authoring more than 50 books and 650 articles, Bill has been a monthly columnist with the Business Intelligence Network, EIM Institute and Data Management Review. In 2007, Bill was named by Computerworld as one of the “Ten IT People Who Mattered in the Last 40 Years” of the computer profession. Having 35 years of experience in database technology and data warehouse design, he is known globally for his seminars on developing data warehouses and information architectures. Bill has been a keynote speaker in demand for numerous computing associations, industry conferences and trade shows. Bill Inmon also has an extensive entrepreneurial background: He founded Pine Cone Systems, later named Ambeo in 1995, and founded, and took public, Prism Solutions in 1991. Bill consults with a large number of Fortune 1000 clients, and leading IT executives on Data Warehousing, Business Intelligence, and Database Management, offering data warehouse design and database management services, as well as producing methodologies and technologies that advance the enterprise architectures of large and small organizations world-wide. He has worked for American Management Systems and Coopers & Lybrand. Bill received his Bachelor of Science degree in Mathematics from Yale University, and his Master of Science degree in Computer Science from New Mexico State University. Dan has more than 25 years of experience in the Data Warehousing and Business Intelligence field and is internationally known for inventing the Data Vault 1.0 model and the Data Vault 2.0 System of Business Intelligence. He helps business and government organizations around the world to achieve BI excellence by applying his proven knowledge in Big Data, unstructured information management, agile methodologies and product development. He has held training classes and presented at TDWI, Teradata Partners, DAMA, Informatica, Oracle user groups and Data Modeling Zone conference. He has a background in SEI/CMMI Level 5, and has contributed architecture efforts to petabyte scale data warehouses and offers high quality on-line training and consulting services for Data Vault.